The USN FWS, Fighter Weapons School, commonly referred to as "Top Gun", was based at NAS Miramar, CA, but has since been moved to NAS Fallon, NV. 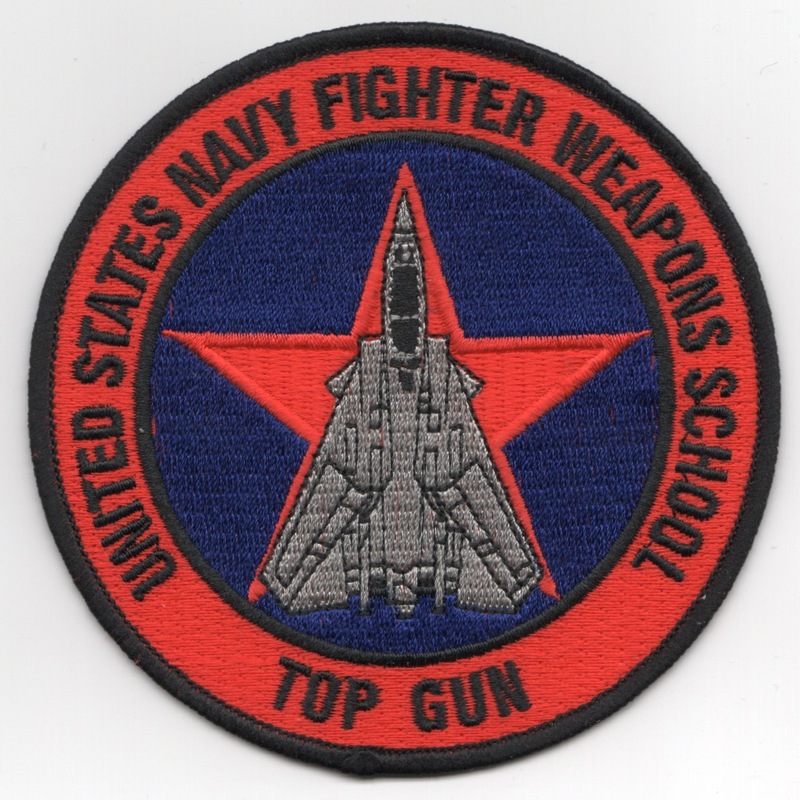 This is the old version of their F-5 "Tigershark" TOP GUN (STAR) patch. The USN FWS, Fighter Weapons School, commonly referred to as "Top Gun", was based at NAS Miramar, CA, but has since been moved to NAS Fallon, NV. This is the old version of their F-14 "Tomcat" TOP GUN (STAR) patch. The USN FWS, Fighter Weapons School, commonly referred to as "Top Gun", was based at NAS Miramar, CA, but has since been moved to NAS Fallon, NV. 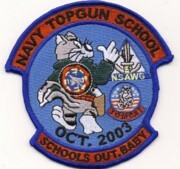 This is the class patch created for the class that graduated in October 2003. The FWS, Fighter Weapons School, commonly referred to as "Top Gun", was based at NAS Miramar, CA, but has since been moved to NAS Fallon, NV. This is the old version of their color patch. 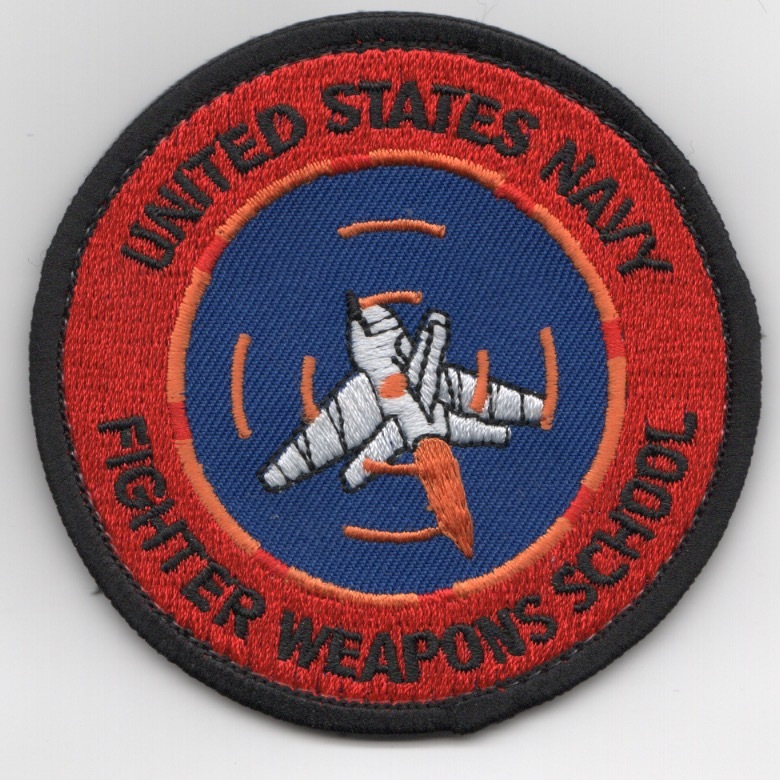 The USN FWS, Fighter Weapons School, commonly referred to as "Top Gun", was based at NAS Miramar, CA, but has since been moved to NAS Fallon, NV. This is the second version (historically) of their color patch worn by graduates. This patch does NOT come w/velcro. The FWS, Fighter Weapons School, commonly referred to as "Top Gun", was based at NAS Miramar, CA, but has since been moved to NAS Fallon, NV. This is the desert/black version of the patch worn by graduates. The FWS, Fighter Weapons School, commonly referred to as "Top Gun", was based at NAS Miramar, CA, but has since been moved to NAS Fallon, NV. This is the desert/desert version of the patch worn by graduates. The FWS, Fighter Weapons School, commonly referred to as "Top Gun", was based at NAS Miramar, CA, but has since been moved to NAS Fallon, NV. This is the new version of their patch and does not have velcro attached. The FWS, Fighter Weapons School, commonly referred to as "Top Gun", was based at NAS Miramar, CA, but has since been moved to NAS Fallon, NV. This is the new version of their patch and does have velcro attached. This is the squadron patch for the Naval Strike and Air Warfare Center. This is for the Strike Aircraft Test division located at NAS Fallon, NV. This is the Naval Strike Air Warfare Center's felix patch, created just for them. The Naval Strike and Air Warfare Center (NSAWC) at Naval Air Station Fallon is the center of excellence for naval aviation training and tactics development. NSAWC provides service to aircrews, squadrons and air wings throughout the United States Navy through flight training, academic instructional classes, and direct operational and intelligence support. The command consists of more than 130 officers, 250 enlisted and 500 contract personnel. NSAWC flies and maintains F/A-18 Hornets, F-14 Tomcats and SH-60F Seahawk helicopters. This is the "blue-camo'ed" version of the Naval Strike Air Warfare Center's aircraft triangle patch, created just for them. The Naval Strike and Air Warfare Center (NSAWC) at Naval Air Station Fallon is the center of excellence for naval aviation training and tactics development. NSAWC provides service to aircrews, squadrons and air wings throughout the United States Navy through flight training, academic instructional classes, and direct operational and intelligence support. The command consists of more than 130 officers, 250 enlisted and 500 contract personnel. NSAWC flies and maintains F/A-18 Hornets, F-14 Tomcats and SH-60F Seahawk helicopters. This is the "desert-camo'ed" version of the Naval Strike Air Warfare Center's aircraft triangle patch, created just for them. The Naval Strike and Air Warfare Center (NSAWC) at Naval Air Station Fallon is the center of excellence for naval aviation training and tactics development. NSAWC provides service to aircrews, squadrons and air wings throughout the United States Navy through flight training, academic instructional classes, and direct operational and intelligence support. The command consists of more than 130 officers, 250 enlisted and 500 contract personnel. NSAWC flies and maintains F/A-18 Hornets, F-14 Tomcats and SH-60F Seahawk helicopters. These nametags are worn by the Tomcat pilots that are assigned to the Strike Weapons and Tactics, Atlantic school which is located at NAS Oceana, VA. These nametags are worn by the Tomcat RIOs that are assigned to the Strike Weapons and Tactics, Atlantic school which is located at NAS Oceana, VA.
Strike Weapons and Tactics School, Atlantic is located at NAS Oceana, VA and is the tactics school for the F-14 Tomcat. The A-6 Intruder started it, and now the F-18 Hornet is joining them. 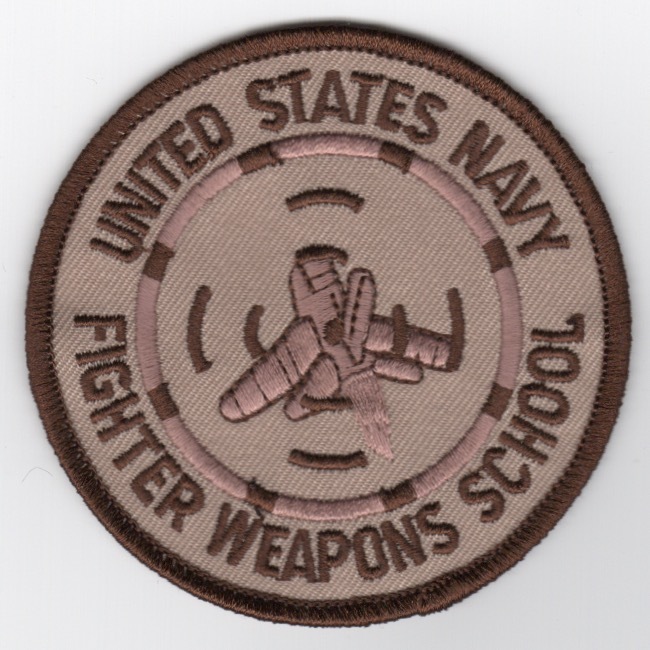 This is the patch used by the F-14 school. This is the squadron patch for the F/A-18 Hornet's Strike Fighter Weapons School - Pacific. This school is located at NAS Lemoore, CA, and is the "West Coast equivalent" of the SWATSLANT school for the "Atlantic Fleet". This is the new desert version of the triangle patch for the Strike Fighter Weapons School, Atlantic for the F/A-18 Hornet and the F-14 Tomcat located at NAS Oceana, VA. When the schools combined the officers got together to brainstorm a new design and command motto. Across the top of the triangle patch it says "Advocati Diaboli", loosely translates to "Devil's Advocates". Being that we fly aggressor missions for the fleet we are in a sense the Devil's advocates. We "argue" the opposite side of a point to prove it's validity. With that motto accepted the FA-18 officers wanted to preserve the F-14 heritage in the new school since the Strike Fighter name was staying and the F-14 is slowly being decommissioned. The obvious choice was the decommissioned F-14 squadron, VF-74 Bedevilers. With a redesigned Devil and replacing the old bomb site with the missle site from the "Top Gun" Fighter Weapons School design the new patch was formed. This is the new round squadron patch for the Strike Fighter Weapons School, Atlantic for the F/A-18 Hornet and the F-14 Tomcat located at NAS Oceana, VA. When the schools combined the officers got together to brainstorm a new design and command motto. Across the top of the triangle patch it says "Advocati Diaboli", loosely translates to "Devil's Advocates". Being that we fly aggressor missions for the fleet we are in a sense the Devil's advocates. We "argue" the opposite side of a point to prove it's validity. With that motto accepted the FA-18 officers wanted to preserve the F-14 heritage in the new school since the Strike Fighter name was staying and the F-14 is slowly being decommissioned. The obvious choice was the decommissioned F-14 squadron, VF-74 Bedevilers. With a redesigned Devil and replacing the old bomb site with the missle site from the "Top Gun" Fighter Weapons School design the new patch was formed. This is the new pilot nametag for the Strike Fighter Weapons School, Atlantic for the F/A-18 Hornet and the F-14 Tomcat Pilots that teach at the Weapons School located at NAS Oceana, VA. When the schools combined the officers got together to brainstorm a new design and command motto. Across the top of the triangle patch it says "Advocati Diaboli", loosely translates to "Devil's Advocates". Being that we fly aggressor missions for the fleet we are in a sense the Devil's advocates. We "argue" the opposite side of a point to prove it's validity. With that motto accepted the FA-18 officers wanted to preserve the F-14 heritage in the new school since the Strike Fighter name was staying and the F-14 is slowly being decommissioned. The obvious choice was the decommissioned F-14 squadron, VF-74 Bedevilers. With a redesigned Devil and replacing the old bomb site with the missle site from the "Top Gun" Fighter Weapons School design the new patch was formed. This is the new RIO nametag for the Strike Fighter Weapons School, Atlantic for the F/A-18 Hornet and the F-14 Tomcat RIOs that teach at the Weapons School located at NAS Oceana, VA. When the schools combined the officers got together to brainstorm a new design and command motto. Across the top of the triangle patch it says "Advocati Diaboli", loosely translates to "Devil's Advocates". Being that we fly aggressor missions for the fleet we are in a sense the Devil's advocates. We "argue" the opposite side of a point to prove it's validity. With that motto accepted the FA-18 officers wanted to preserve the F-14 heritage in the new school since the Strike Fighter name was staying and the F-14 is slowly being decommissioned. The obvious choice was the decommissioned F-14 squadron, VF-74 Bedevilers. With a redesigned Devil and replacing the old bomb site with the missle site from the "Top Gun" Fighter Weapons School design the new patch was formed. Homepage | Order FWS/SFW Patches!